I think the meanings of names are really interesting. We gave our oldest daughter her name because it was unique. Different. We didn’t know any Kaitlyn’s at the time. And our younger daughter we named after one of my best friends, Alyssa. I think they are wonderful names. Have you ever looked up the meaning of your name? When Kaitlyn was dedicated in church the pastor asked me to find out what her first and middle names mean. It turns out she is “Pure Friend”. And Alyssa is “Floral Beauty”. Isn’t that cool? We put two names together and they go together so well! (And just for giggles…I’m a “Beautiful Brave Bridge” ). When I was pregnant with each of the girls we of course came up with a boys name before finding out for sure we would be giving birth to girls. We had chosen Zachariah as his name. And even though we didn’t have a boy, the meaning of his name has always warmed my heart. “Jehovah has remembered”. God has many, many names. And each name in the Bible has a unique meaning. 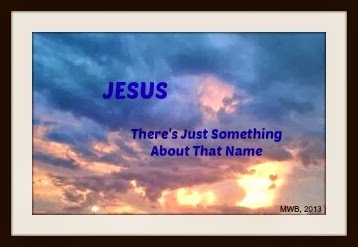 THE name above all names, beautiful Savior, glorious Lord. JESUS. THE ONE who bore our sorrows, suffered our pain, took on our sins and died and was buried in a tomb. JESUS. THE ONE who rose from the dead and now sits at the right hand of His Father in Heaven. JESUS. THE ONE whose name whispers…peace! Oftentimes it feels like He has gone to Heaven and forgotten us. We feel so alone and abandoned. But we’re not. Because JESUS IS EMMANUEL: GOD WITH US. Sometimes when I’m feeling really down and I don’t know where to read in my Bible, I begin to think of His names. I saw this video at a Beth Moore conference a few years ago. It is a 5 minute countdown of the names of God and they played it right before we would start a session. It gave me goosebumbs as I watched each name come onto the screen and it still does every time I watch it. How big is our God? Here’s a glimpse…. Isn’t it time you let the King of kings, the Lord of lords, Jesus, the Messiah, the Prince of Peace invade your life? Hi Marcie! How funny, because I am writing an article on the meaning of names. My name Cecilia means 'blind'. Isn't that…uninspiring?? But I thought about it some more and that's what I'm writing about. God is in everything, including our names. Amazing, isn't it? As you know, I'm a huge fan of the different Names of God. His complexity and magnitude amazes me. This is what we named our children. We chose their names for the meanings: David (Beloved of God), Matthew (Gift of God), Nancy Marie (Gracious Friend ). Ceil! That is so cool! I'll look for that one! There was another friend who posted about the same thing….in a slightly different way of course…yesterday. What a blessing for God to put this on so many of our hearts this week. Nan, you a fan of the Names of God? Nah, hadn't noticed. Just kidding! I love the meanings of your families names. It is so cool how we can put names together like that. Thank you for sharing!